Showing or hiding learning tools in your assignments can transform your assignments into either instructional or assessment tools. You can control access to specific learning tools for the assignment or for individual questions, and you can make access dependent on your students' having attempted the question a number of times. You can show your own hint for any question on your assignments, and set the hint to be shown only after a certain number of submissions. Adding custom hints to assignment questions is not the same as adding hints in your own questions using the $HINT variable. You can show or hide the Practice Another Version feature for questions on your assignment. For questions with randomized values, Practice Another Version lets your students attempt the same question with a different randomization for no credit. You can show or hide the answer key for questions on your assignment. Usually, you should show the answer key only after the due date to ensure that no students see the key before submitting responses. You can show or hide solutions for questions that include them (many questions do not). 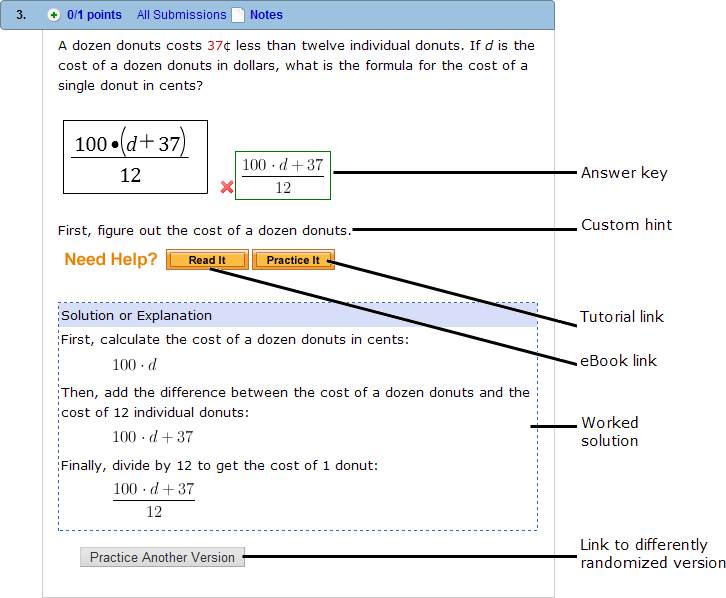 A solution supplements the answer key by explaining the process for obtaining the correct answer. Usually, you should show solutions only after the due date to ensure that no students see the solutions before submitting responses.